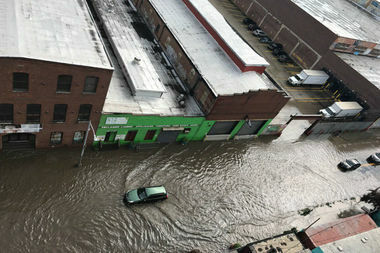 The Gowanus Canal recently flooded surrounding streets after a summer storm pounded the area. GOWANUS — Five years after the Sandy storm surge inundated Gowanus with roughly five feet of toxic water from the canal, officials are considering building a 90-foot-wide gate along Hamilton Avenue that would be paid for in part by property tax increases in the neighborhood, according to a city-commissioned report. The option is one of several under review, including a massive, 200-foot wide flood gate in Gowanus Bay or barriers at other points along the canal. The fear of another catastrophic storm remains for the 7,000 residents surrounding the canal. And more is at stake than ever before as the city considers morphing the low-rise industrial landscape into a booming new neighborhood of residential towers. According to the report, flood protections along the polluted waterway are the best option, but are costly and come with a slew of logistical challenges. In 2014, the city's Economic Development Corporation and the Mayor's Office of Recovery and Resiliency commissioned a team of consultants to study the possibility of erecting a storm surge barrier at the Gowanus Canal. The findings were circulated among several city agencies in a January 2016 study, but otherwise went mostly unnoticed by the public and media. Local elected officials were largely unaware of the completed report's conclusions. Funded by a disaster recovery grant from the U.S. Department of Housing and Urban Development, the report developed a flood protection strategy by evaluating the cost, benefit, reliability and implementation of a handful of concepts. The city-commissioned study identified three locations where flood protections could be constructed: along Hamilton Avenue; at 19th Street; and out in Gowanus Bay between Red Hook’s Columbia Street pier and Sunset Park’s Sims Municipal Recycling Facility near 29th Street. The $1 million-study was intended to urge the U.S. Army Corp of Engineers to fold the Gowanus analysis into broader remediation efforts around the harbor. City officials said the findings were promising and the study is likely the first in a series over the next decade that will delve into the minutiae of such a complex undertaking. “The city’s analysis showed that a storm surge barrier for the Gowanus Canal would work," said Daniel Zarrilli, the city's senior director of climate policy and programs and chief resilience officer, whose office forwarded the study to Army Corps for further evaluation. "We continue to act with urgency and in coordination with local, state, and federal partners to ensure that we make the right investments for and with the community as we build a more resilient city,” Zarrilli told DNAinfo New York on Wednesday. But the study is nearly two years old. And one local official is hoping for greater transparency with the community on possible next steps. The glacial pace is unnerving when the threat of a devastating flood for canal-side businesses and homes has only heightened over the years, said a manager at Big Reuse, which is located on Ninth Street mere feet from the canal. "It's not just a major storm anymore — every time it rains really hard the canal comes inches from flooding the parking lot behind us," explained Forrest Gillespie, who said their warehouse of second-hand furniture, materials​ and items was inundated with slime from the canal after Sandy. "I'd like to see a physical flood wall — at least something to protect us." Some might envision those protections as merely a massive flood gate, but a storm surge barrier would more likely be a network of in-water and upland defenses that combine permanent and deployable components like flood walls, deployable barriers and operable gates, the report says. Flood gates would protect against flood waters rising to a 21-foot elevation in the canal, while land barriers would stop a surge of up to 17 feet, according to the report. This would protect residents through 500-year flood events of up to 15-feet, the city's report states. It would be an especially vital defense as scientists predict floods that used to strike New York City only once every 500 years could now occur every five years within the next three decades, according to findings published in the Proceedings of the National Academy of Sciences on Monday. But the reach of protection depends on where it is viable to place a blockade. A barrier in the bay would protect the largest swath of land, but a flood gate there could create a slew of obstacles including a bottleneck of boat traffic and the water’s depths would require a 56-foot high gate that would be among some of the largest in the world. The inlet option was ultimately ruled out by authors of the report, and instead, the field was narrowed to three concepts: Two focused around Hamilton Avenue and a third centered on 19th Street. But the preferred option is what the report calls the Hamilton Avenue right-of-way (ROW). The least mired in legal and planning complications, the Hamilton Avenue option would run a mix of permanent and deployable flood walls from Clinton Street to Third Avenue along the thoroughfare. It is particularly attractive because it would mostly be erected along a public road — maximizing public control while minimizing business disruptions, the report concludes. In order to do this, the barrier system relies on a defense made mostly of deployable components, which takes time to put in place and can be vulnerable to system failures, the report notes. But the main section of the Hamilton Avenue concept rests on a 90-foot wide 43-foot tall two-door gate — which is considered one of the simplest storm surge barrier options with the lowest cost and ease of operation. To function, the project would commandeer the first 100-feet of bulkhead from the Hamilton Avenue Bridge and eat into the operation of the Department of Transportation's Hamilton Avenue Asphalt Plant directly to the east of the canal. The city would have to determine what sacrifices it is willing to make for the configuration, but because the land is already city owned the costly step of acquiring the parcel is eliminated, according to the report. That is not the case to the west of the canal at Hamilton Avenue. Currently, Makaka Toys, a collectable toy store founded in 1992, resides on that lot with its back portion rented out for parking. The city would either have to purchase or lease the space, which could translate to hefty costs. It is hard for researchers to suss out the project's price tag this early on, but the report estimates a minium of $108 million to complete the Hamilton Avenue ROW concept with annual operation and maintenance costs of $626,000. That $108 million, however, does not include funds to purchase land or account for engineering risks that could blow the budget. But if the project were to come in at that figure, the city would only be on the hook for 35 percent or $38 million of the funds with the U.S. Army Corp of Engineers footing the rest of the bill. The city would also have to shell out an additional $15 million for operation costs over the next 50-years, the report factored in. 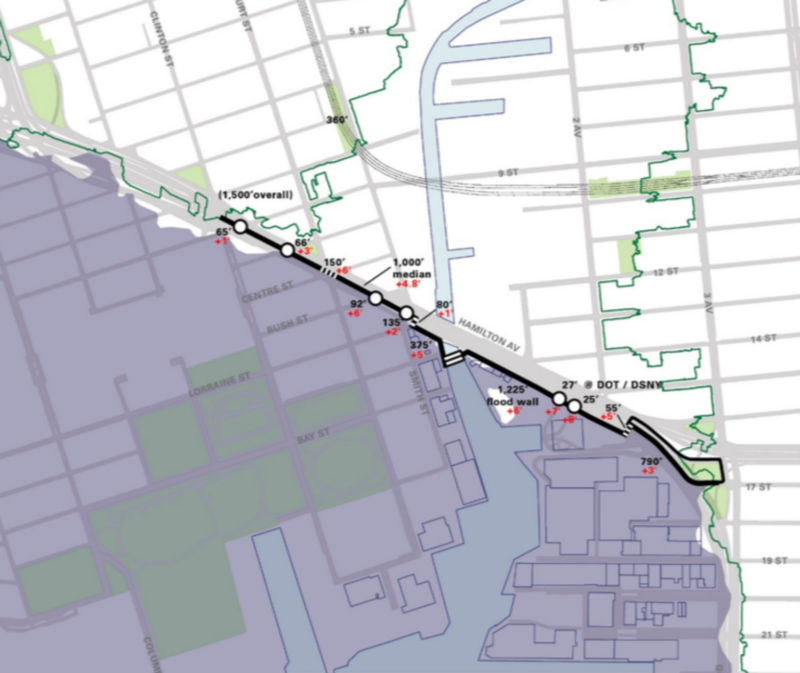 Since a storm surge barrier would boost property values, researchers suggest a value capture tool to fund the project known as a "special assessment district" where the market value of the area's real estate is enhanced due to a public improvement and a tax is apportioned to recover the project costs — similar to how the city aims to finance the proposed BQX Brooklyn-Queens Connector streetcar project. But the canal is also a federal Superfund site and a storm surge barrier can't get underway until the Environmental Protection Agency is done dredging black mayonnaise from the canal's depths — a monumental task that won't be complete until about 2027. A lengthy process of studies and certifications would have to happen before a Gowanus Canal storm surge barrier could become a reality. In the meantime, the U.S. Army Corp of Engineers has agreed to fold the Gowanus report into its New York/New Jersey Harbor & Tributaries Focus Area Feasibility Study, according to spokesmen with the Army Corp and the Mayor's Office of Recovery and Resiliency. Yet that too won't be completed for several years.